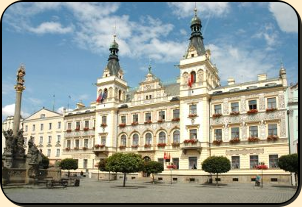 Pardubice is an important university city. It is located in East Bohemia about 1.5 hours drive from the capital city of Prague. The historical center of the city was declared as an urban conservation area with a dominant „green gate“. On the front of the building there is a relief designed by Mikoláš Aleš. It depicts the coat of arms of the lords of Pardubice, their coat of arms is used by Pardubice as a city emblem. The Renaissance chateau is a dominant building in the town of Pardubice. It was built under the rule of the Pernštejn lords. Inside the castle there are beautiful paintings, original stone portals and cassette ceilings. The beautiful burgher houses on Perštýnské square bear traces of late Gothic architecture. Most of the houses were renovated during the Baroque, Rococo, Classicist, and Empire and later reconstructions. Among the houses is the famous facade of the house of “U Jonas”. You can also see the magnificent town hall and the plague column with the statue of Our Lady. You can also visit the ruins of Kunětická hill from the beginning of the 15th century in the vicinity of Pardubice. The castle is a cultural monument. From the hill you can admire the beautiful surrounding countryside. The Pardubice Region is also known thanks to its gingerbread and the world-famous racecourse, which is held every year by the international steeplechase race – Velká Pardubická. Jan Kašpar is one of the most famous Czech pilots. It was he that piloted the very first Czech aero plane. He came from Pardubice, studied at Prague Technical University and first started work at a factory making components for airships. He dreamed of flying himself, and because even the cheapest airship was far too expensive for him to buy, he decided to build his own flying machine, just like the Brothers Wright did. His first flight, which was over a distance of two kilometers, was on April 16, 1910, a mere seven years after the first flight conducted by Wilbur and Orville. This day is regarded as the birthday of Czech aeronautics. On May 13, 1911, he carried out his historic flight from Pardubice to Prague. Don’t hesitate to contact us, arrange for a private car and driver to explore more about the intricacies of Pardubice and its delicious gingerbread tradition.